Home and business owners should use an antibiotic to help limit a new disease threatening certain species of Florida palm trees, a University of Florida scientist says. Lethal bronzing is killing palm species known as Sabal palmetto (sabal or cabbage palms), Phoenix sylvestris (silver date palms), Phoenix dactylifera (date palms) and Phoenix canariensis (true date palms), said Brian Bahder, an entomology assistant professor with the UF Institute of Food and Agricultural Sciences. “It is killing our state tree, which is native and important for the environment,” Bahder said. Palm trees growing in Coral Springs, Florida. In addition to helping the environment, palm trees also enhance Florida’s economy. About $84 million worth of palms grown in the Sunshine State were sold in 2015, a UF/IFAS study found. While lethal yellowing still damages some Florida palm trees, the deaths caused by lethal bronzing are now capturing scientists’ attention, Bahder said. Once they’ve been infected, palm trees cannot recover from lethal bronzing. To combat the disease, Bahder says property owners should use an antibiotic called oxytetracycline on healthy trees so the disease doesn’t spread to them. They’re conducting studies on antibiotic injections to be able to provide better injection recommendations. 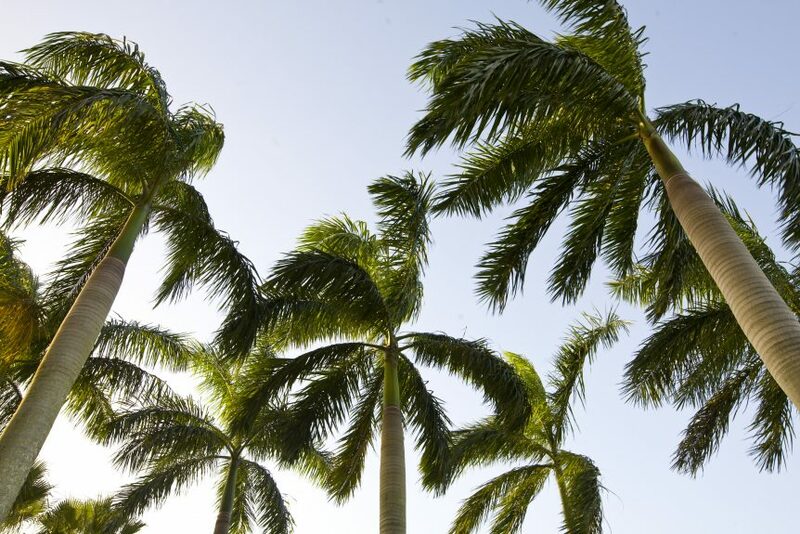 Meanwhile, home and business owners should cut down and get rid of diseased palm trees, said Bahder, a faculty member with the UF/IFAS Fort Lauderdale Research and Education Center. Bahder suggests cutting down your diseased trees with a chainsaw, then cutting them into manageable pieces for bulk pickup. There’s no danger of it spreading, he said. Scientists are trying to find the insect that transmits lethal bronzing to the trees. Bahder and his research team have been surveying symptomatic palms for about a year and so far, they’ve narrowed the list to two potential insects as possible conveyors of lethal bronzing. There’s more research ahead for Bahder and his team For example, they’re conducting population and distribution studies to better understand the biology of the insect species believed to be transmitting lethal bronzing into the palm trees. More specifically, scientists need to know when the adult and juvenile populations of the insects are at their peak, Bahder said. That way, researchers will know which insects to target and when so they can control them most effectively. Meanwhile, scientists have developed high-resolution extraction and detection techniques to find the disease, Bahder said. They use various methods, including digital DNA amplification technology to find the bacteria that produces the lethal bronzing at lower levels. It’s important to follow UF/IFAS recommendations regarding lethal bronzing, he said. Those who think they have diseased trees can contact Bahder at bbahder@ufl.edu.